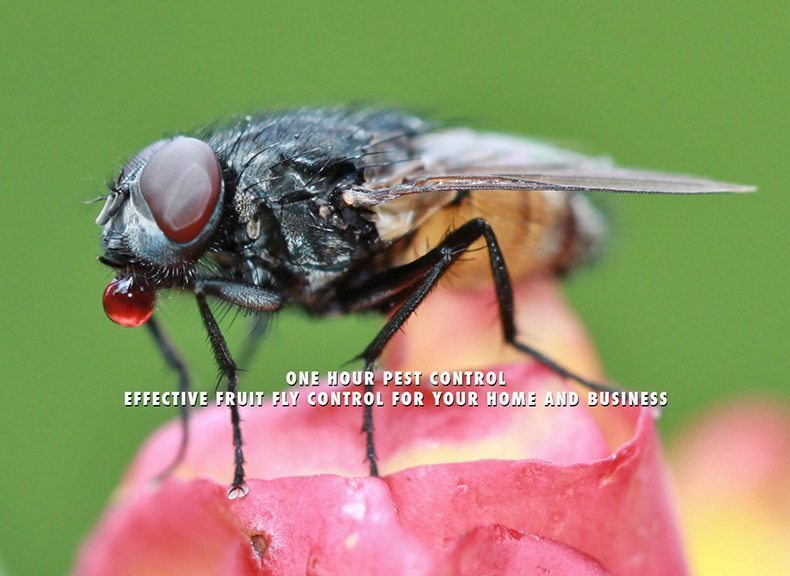 Small fruit fly infestations are frequently encountered by pest control exterminators in a wide variety of accounts. These flies should not be confused with the true fruit flies of the family Tephritidae, e.g., Mediterranean fruit fly, which can be serious pests of fruit crops. Adequate knowledge of the biology of the family Drosophilidae is required to properly locate harborage sites. However, not all breeding areas are readily located. Knowing the unique sites where infestations can occur in different types of accounts helps the PCO solve the problem more rapidly. Otherwise, the result is a period of endless callbacks, frustrated technicians and dissatisfied customers, and eventual cancellation. Drosophila spp. Adults about 1/8 inch (3mm) long, including the wings. Color dull, tan to brownish yellow or brownish black; eyes usually bright red. Antenna with feathery bristle (arista). First hind tarsal segment long and slender, much longer than second segment. Drosophila melanogaster adults about 1/8 inch (3mm) long, tan with abdomen blackish above and grayish below, and bright red eyes. Mature D. melanogaster larvae are about 1/4 to 3/8 inch (7-8mm) long, eyeless, legless and tapering toward head from large rounded rear segment, head represented by two dark hooks. Color near white except mouth hooks black and tips of posterior terminal abdominal spiracles (breathing pores) yellowish. Posterior spiracles at end of short stalks/fleshy tubes which are in contact or joined at their bases. Other species may have posterior spiracle stalks dark and/or have whorls of setae (hairs) at their ends, and/or have the bottom side of abdomen with darkened cross bands (setulae). Adult females lay their eggs (average about 500) near the surface of fermenting fruits and vegetables or near the cover cracks in imperfectly sealed containers of such materials. The eggs hatch in about 30 hours. The larvae develop in the briny or vinegar-like liquids of the fermenting materials where they feed near the surface and primarily on the yeast, for about 5-6 days. Prior to pupation, the larvae crawl to drier areas of the food or elsewhere. The brown, seedlike sheath containing the pupa (the puparium) is formed from the last larval skin/exoskeleton (pupal stage is approximately 1 day long). The newly emerged adults mate in about 2 days. The life cycle (adult to adult) may be completed in 8-10 days at 85 degrees F (29 degrees C). Their reproductive potential is enormous. Larval development sites are commonly found in fermenting fruits and vegetables and in their by-products, such as cider or alcohol. The larvae can also be found in briny or vinegar-like liquids where they feed near the surface primarily on yeast. Pupal cases can be located in drier areas on or near the infested food source. Adults are often seen flying or resting on surfaces close to breeding areas. Due to their rapid life cycle, fruit flies can exploit numerous areas of temporary occurrence. Specific examples are as follows. Residences: Look for fermenting grapes, potatoes, onions, bananas, tomatoes, and other fruits and vegetables. Soiled trash compactors, trash chutes, garbage disposal units, compost piles, dirty garbage cans, and bottles and cans being saved for recycling are common breeding sites. Some species develop in animal and human excrement. Food Service Facilities: Food debris under equipment, in dumbwaiter and elevator pits, and in drains are prime breeding areas. Soiled linens, soured mop heads, beer taps, liquor-storage areas, containers in recycling bins, refrigeration drip pans, spilled soda syrup and alcohol are possible locations. Food debris that accumulates under trash can liners are often overlooked. Food particles in mop water can wash into cracks and crevices to provide larvae developmental sites as can standing water on kitchen, bar, and bathroom floors. Inspect locker rooms for food left in lockers by employees. Check food storage areas for overripe fruit. Food Processing/Industrial Facilities: Inspect for many of the same areas as mentioned under food service facilities. In addition, check food and product waste disposal systems, pallets and trash dumpsters. Small accumulations of food debris on surfaces and in cracks around equipment are common problem areas. Leakage from sink drains and debris clinging under sink edges are potential areas. Wall/floor junctions often are not properly sealed, creating prime breeding sites for the larvae. In processing areas that are frequently hosed down, look for plastic material, which often traps and holds moisture or food debris. Health Care Facilities: Small fruit fly infestations often originate in dietary preparation areas and can be found along distribution paths throughout the facility. Look for similar larval developmental sites as noted under food service facilities. The adult flies are attracted by odor cues to fruit in patient rooms and employee lockers, food carts, pantries, hairdresser shops, break areas, trash receptacles, and janitor closets. Commercial/Office Facilities: Inspect break rooms and vending areas for breeding sites. Many buildings now have recycling programs that include the placement of collection bin within the facilities. Often the bins are not emptied frequently enough and/or are not thoroughly cleaned when they are emptied. This also applies to trash receptacles throughout a facility. Sometimes food debris that falls under trash can liners are a source of infestation. Animal Research Facilities/Zoos: Pay particular attention to the areas where the food for animal consumption is held and prepared. Floor drains in the animal quarters can be excellent harborage sites. Often these areas are washed down daily and any cracks or crevices present allow organic matter to accumulate in them. Certain types of animal bedding (especially rabbit) are particularly attractive as larval development sites to small fruit flies. Clean thoroughly and frequently floor areas under food preparation surfaces, fixtures, and equipment. Use a brush to clean and flush floor drains and debris traps weekly. Repair leaking plumbing or beverage lines. Hang up mops and brooms to dry after each use. Have soiled linens removed and cleaned at least twice a week. Move dumpsters and trash containers as far away from entrances as possible. Thoroughly wash containers destined for recycling before placement in a bin or have the bins emptied and cleaned at least twice a week. Discard residential organic waste in tightly sealed plastic bags or compost it. When composting, the waste material should be turned daily or every other day the first week to significantly reduce fly breeding. Seal cracks and crevices where food particles can accumulate with an appropriate material (see ESPC 039817). Clean accessible floor drains of organic scum using an electric drill fitted with a 12 inch extender and a 3 inch diameter wire sanding wheel. This setup is aided by running tap water into the drain during and following the procedure to flush away debris. Install air doors/curtains at exterior entrances. Place flying insect jar traps (commercially available) baited with fruit juice, vinegar, or beer in strategic locations. Replace window or door screening with a fine mesh to prohibit small fruit fly entrance since they often can penetrate ordinary screening. While a minimum size of 20 mesh is required to keep out fruit flies, 32-mesh screening will also keep out most other flies. Insect light traps attract small fruit flies (see ESPC 039813). Adult flies can be by killed using aerosol or ULV space treatments. Where the label allows, a borate material may be applied in stagnant drains that are difficult to access mechanically. Long-term control of small fruit flies is only achieved by identifying or eliminating larval development sites. Because good sanitation practices are absolutely necessary in controlling these flies, obtaining customer cooperation is of paramount importance for a successful program.